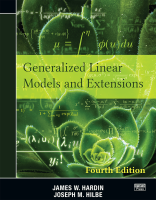 Generalized Linear Models and Extensions, 3rd ed. Generalized linear models (GLMs) extend linear regression to models with a non-Gaussian or even discrete response. GLM theory is predicated on the exponential family of distributions—a class so rich that it includes the commonly used logit, probit, and Poisson models. Although one can fit these models in Stata by using specialized commands (for example, logit for logit models), fitting them as GLMs with Stata’s glm command offers some advantages. For example, model diagnostics may be calculated and interpreted similarly regardless of the assumed distribution. This text thoroughly covers GLMs, both theoretically and computationally, with an emphasis on Stata. The theory consists of showing how the various GLMs are special cases of the exponential family, showing general properties of this family of distributions, and showing the derivation of maximum likelihood (ML) estimators and standard errors. Hardin and Hilbe show how iteratively reweighted least squares, another method of parameter estimation, is a consequence of ML estimation using Fisher scoring. The authors also discuss different methods of estimating standard errors, including robust methods, robust methods with clustering, Newey–West, outer product of the gradient, bootstrap, and jackknife. The thorough coverage of model diagnostics includes measures of influence such as Cook’s distance, several forms of residuals, the Akaike and Bayesian information criteria, and various R2-type measures of explained variability. After presenting general theory, Hardin and Hilbe then break down each distribution. Each distribution has its own chapter that explains the computational details of applying the general theory to that particular distribution. Pseudocode plays a valuable role here because it lets the authors describe computational algorithms relatively simply. Devoting an entire chapter to each distribution (or family, in GLM terms) also allows for the inclusion of real-data examples showing how Stata fits such models, as well as the presentation of certain diagnostics and analytical strategies that are unique to that family. The chapters on binary data and on count (Poisson) data are excellent in this regard. Hardin and Hilbe give ample attention to the problems of overdispersion and zero inflation in count-data models. The final part of the text concerns extensions of GLMs. First, the authors cover multinomial responses, both ordered and unordered. Although multinomial responses are not strictly a part of GLM, the theory is similar in that one can think of a multinomial response as an extension of a binary response. The examples presented in these chapters often use the authors’ own Stata programs, augmenting official Stata’s capabilities. Second, GLMs may be extended to clustered data through generalized estimating equations (GEEs), and one chapter covers GEE theory and examples. GLMs may also be extended by programming one’s own family and link functions for use with Stata’s official glm command, and the authors detail this process. Finally, the authors describe extensions for multivariate models and Bayesian analysis. The fourth edition includes two new chapters. The first introduces bivariate and multivariate models for binary and count outcomes. The second covers Bayesian analysis and demonstrates how to use the bayes: prefix and the bayesmh command to fit Bayesian models for many of the GLMs that were discussed in previous chapters. Additionally, the authors added discussions of the generalized negative binomial models of Waring and Famoye. New explanations of working with heaped data, clustered data, and bias-corrected GLMs are included. The new edition also incorporates more examples of creating synthetic data for models such as Poisson, negative binomial, hurdle, and finite mixture models.